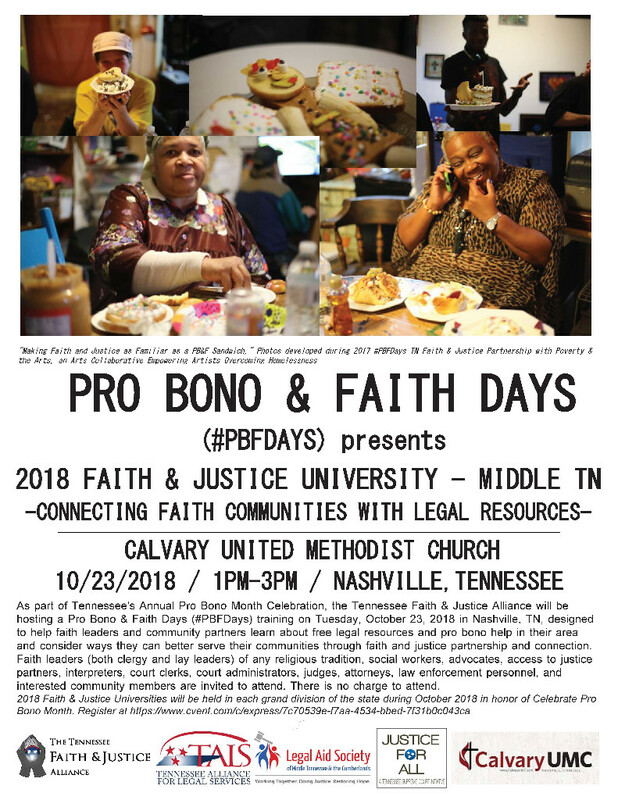 October is “Celebrate Pro Bono Month” and Tennessee lawyers are joining their colleagues across the country to provide free legal services to those in need and honor the good work performed by lawyers every day as part of the annual National Pro Bono Celebration. 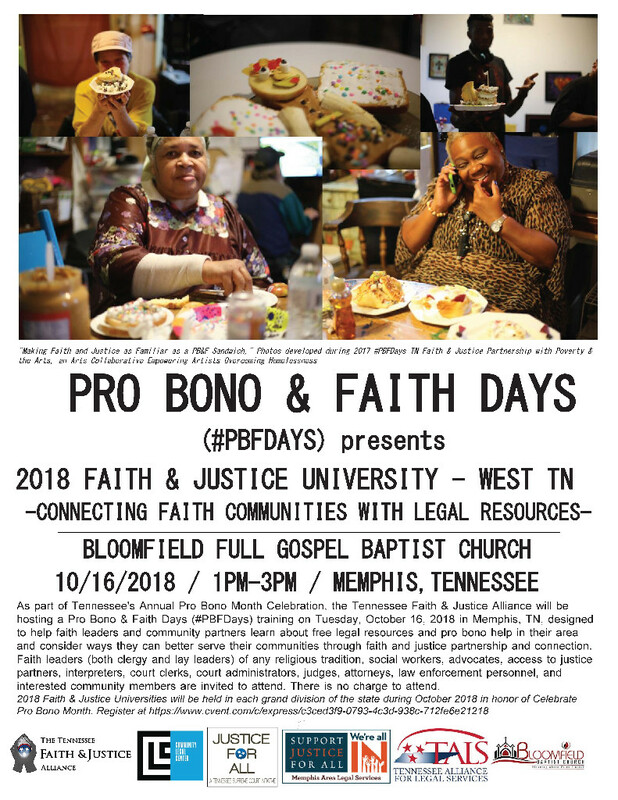 Now in its tenth year, the 2018 statewide Celebrate Pro Bono Month brings together legal services providers with local bar associations, law schools, law firms and individual lawyers to offer free services to those unable to afford a lawyer. Hundreds of volunteers are expected to participate in dozens of events and activities across the state that will offer assistance to Tennesseans in need. Activities include legal advice clinics, education programs, public presentations, celebrations and other events. Hosting or volunteering at a Celebrate Pro Bono Month event? Be sure share to share it on social media with the hashtag #CelebrateProBono. The 2018 National Celebration of Pro Bono is encouraging events focused on disaster preparation and resiliency, in recognition that advance planning and education are critical to providing an effective response when disaster does impact a community. Disasters, both natural and manmade, can result in large populations in immediate need of legal assistance on a number of topics. Disaster survivors face countless legal issues — from insurance disputes to FEMA appeals, landlord tenant disputes, consumer fraud, health and education issues, and so much more. TBA and our partners have resources and materials available that can assist in responding to their needs. Over the past few years, Tennesseans have been called on to provide legal support and assistance in response to disasters within our own state and across the country. Fortunately, technology provides great opportunity for lawyers to deliver assistance remotely, eliminating barriers of distance, scheduling and limited access to those in need. Services such as HELP4TN.org and ABA Free Legal Answers have proven incredibly valuable in increasing connections during times of emergency. Although it is difficult to know when disaster may strike, legal services providers can have a plan in place to mobilize community attorneys to provide pro bono assistance when necessary. Pro Bono Opportunities to Help Storm Victims in N.C. The Supreme Court of North Carolina has issued an emergency order that permits out-of-state lawyers to practice North Carolina law temporarily to provide assistance to indigent victims of Hurricane Florence. The order opens up opportunities for volunteer attorneys from across the country to provide pro bono support in North Carolina or remotely, by working with a legal services organization or through NC Free Legal Answers. A volunteer interest form and the required registration form for out-of-state attorneys are available from the North Carolina State Bar. Every year, Tennessee lawyers help thousands of clients by providing free legal assistance. Though the month of October is an opportunity to focus attention on the significant need for pro bono services as well as celebrate the outstanding work of those who volunteer, the TBA honors those who give their time throughout the year in its annual Pro Bono Honor Roll. For the 2018 honor roll, the TBA is seeking the names of lawyers and law students who volunteered with legal service organizations between Nov. 1, 2017, and Oct. 31, 2018. Please complete this form with the name and county of those who gave time during the last year. The deadline for submitting names is Nov. 30. Email completed forms to TBA Access to Justice Director Liz Todaro. The Tennessee Supreme Court launched an initiative in 2014 to honor attorneys and law students who complete 50 or more hours of pro bono service each year. Those who meet the goal are named “Attorney for Justice” or “Law Student for Justice” by the court, are listed online and are honored at events across the state. Law firms that averaged 50 or more hours of pro bono service per attorney also may apply for recognition. The program is entirely voluntary and based on self-reporting using individual attorney annual registration or this form. Law firms should apply using this form. Attorneys and law offices recognized for their pro bono service will be listed on the Tennessee Supreme Court's Access to Justice website. Celebrate Pro Bono Month events will be promoted in TBA Today and on the TBA website throughout the month. Here is an overview of scheduled Celebrate Pro Bono Events. Please let the TBA know if there is an event that should be included on the 2018 Celebrate Pro Bono Month calendar. Want to Host a CPB Event? Want to host a Celebrate Pro Bono Month event in your community? Several organizations in Tennessee offer opportunities for partnership. Hosting or volunteering at a Celebrate Pro Bono Month event? Be sure share to share it on social media with the hashtag #CelebrateProBono. Low-income Tennesseans have helpful resources they can tap into at any time through the year. The website Help4TN.org and a toll-free telephone hotline at 888-HELP4TN or (888) 395-9297 both offer information and access to referrals and legal advice and TN Free Legal Answers matches individuals with volunteer attorneys. 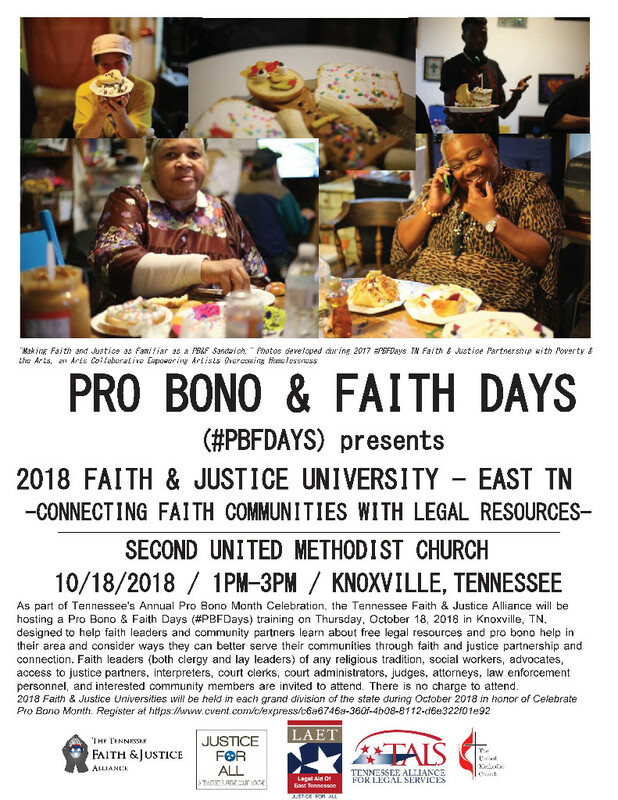 Bar associations, the Tennessee Access to Justice Commission and legal aid and community organizations across the state also support standing legal clinics throughout the year.